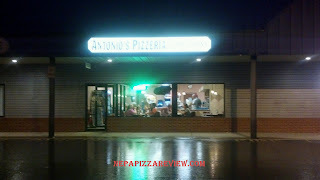 Admittedly, I have been spending quite a bit of time reviewing of pizzerias in the Scranton area. That's not because I'm playing favorites, but because that's where many of the recommendations I receive are, and it happens to be close to home. Well, today I just so happened to be shopping at the new Walmart in Tunkhannock, and was in a hurry to get to a fantasy football draft, so I decided to stop for a quick meal with a fellow pizza critic who was now a seasoned veteran in her third pizza review (yes she came back for more!). 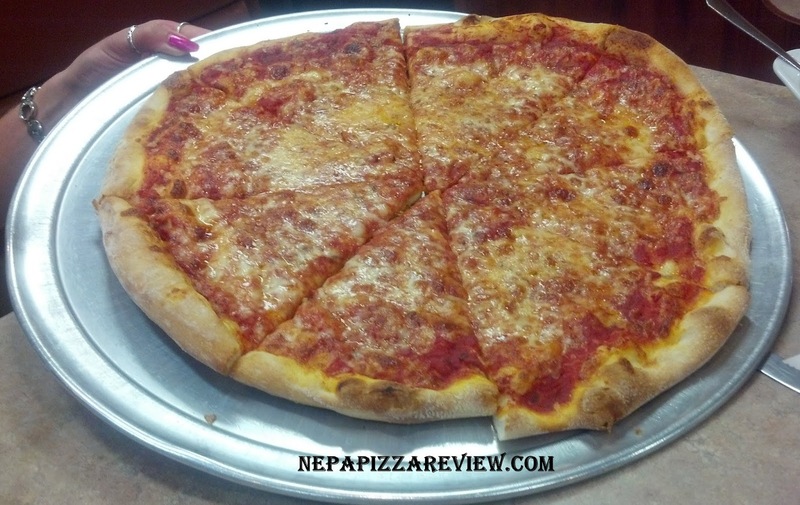 We walked up to the counter and ordered a large 16 inch New York style pizza for the price of $11.00. Ordering is sort of cafeteria style here, and there doesn't seem to be table service, although they do bring the food to you when it's ready. As it turned out, this was the perfect place to go for a quick meal because the pizza was ready within 10 minutes or so. When it came out, I noted that it had a slightly thicker crust, more similar looking to Roberto's than most of the thinner NY style pies out there. I also noticed that the sauce wasn't spread evenly, and the cheese was mostly in the middle, but didn't reach the outer crust - a pet peeve of mine that I call Boardwalk Pizza. If you've ever been to the Jersey Shore and ordered a slice of pizza there, you know that they don't spread the cheese anywhere near the edge in order to scrimp out every bit of profit they can. 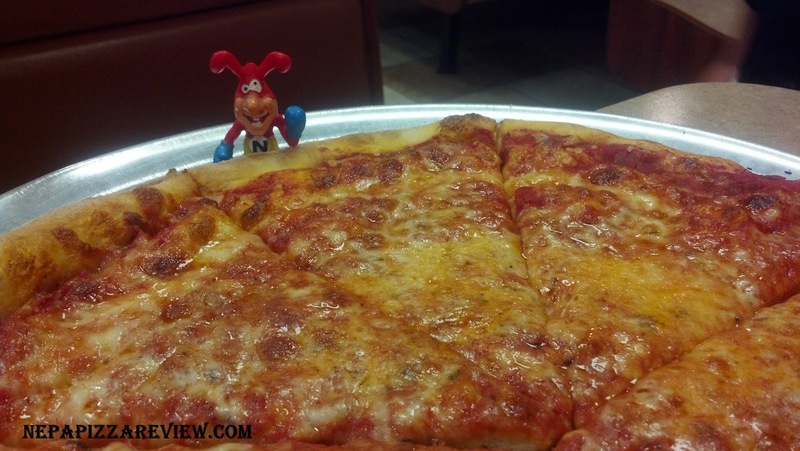 This is a no-no for me, but a boardwalk pizza can still be a good pizza. The next thing I noticed was that the pizza maker probably had some strong arms because he cut all the way through every inch of the pizza, which is usually a good thing, but in this case, it showcased that the pizza was very dry as it was sliding around the metal tray with ease. The cheese did not ooze down the sides like a nice moist pizza usually does. If you don't have a small struggle separating the cheese when picking up the first slice of pizza, it's usually old or not worth eating. We took our first bites and immediately noticed that this was an overall bland and dry pizza. With regard to the sauce, I noticed that the sauce was bitter, dry, and over-seasoned to compensate for the cheap tomatoes. My colleague felt that the sauce was too sweet for her tastes and was not a fan of the high basil content. The dough wasn't cooked all the way, likely because the temperature of the oven was too high for the thickness of the dough that they are using. The dough was very well done on the bottom, as was the cheese on the top, but three-quarters of the crust was like raw dough in the middle. Finally, the cheese was clearly of inferior value, as it was bland, dry, and made the pizza appear as if it were sitting out on the counter for many hours even though it just came out of the oven. Overall, our consensus was that this pizza was a stinker, but the reality is that the pizza served the very purpose that I was seeking - a quick bite to eat on the run. I personally would not drive even a little bit out of my way for this pizza, but if you need a quick slice on the run in the Tunkhannock area, this place is for you. Also, I hear that the steak and cheese pizza and Stromboli's are quite good here.